I try to make fresh pasta once a week and am always trying to think up new and interesting fillings. The idea for this one came after a visit to a local restaurant which included a tuna and hazelnut pate amongst its starters. It was a variation on the sauce for vitello tonnato (veal in tuna sauce) as described by Pellegrino Artusi in his famous cookbook. But the addition of hazelnuts gave it a thicker consistency which allowed it to work well on its own. Ever since, I’ve been wanting to recreate the pate at home. But I couldn’t decide how to serve it. Then, in the middle of a sleepless night, it came to me: ravioli. They are not as hard as they look to make. You have to ensure that your dough is thick enough not to break in cooking. However, it needs to be thin enough to not remain hard around the edges. You can see the technique in this video from Pasta Grannies. As this recipe contains fish, don’t be tempted to put grated parmesan on top. Instead, reserve some of the chopped hazelnuts and sprinkle them over the pasta instead. They will give a pleasing aspect and a crunchy texture to the dish. Sift the two flours together into a bowl. Make a hole in the centre and add the eggs. Beat the eggs with a fork until combined and then slowly mix them into the flours. Keep stirring with the fork until all the eggs have been combined into the flour, then bring the dough together with your hands. Turn the dough out onto a work surface sprinkled with a little semolina flour. Knead the dough for about ten minutes until it has become smooth and the consistency of plasticine. Wrap in clingfilm and allow to rest in the fridge for at least 30 minutes. Meanwhile, put the hazelnuts into a food processor and whizz until they are roughly chopped. Remove a couple of tablespoons of the chopped hazelnuts and reserve. Add the capers, anchovy fillets, and the lemon zest to the food processor and continue chopping until the hazelnuts are a fine powder. Add the eggs and whizz until combined. Add the tuna and mix on full power until combined. With the motor running, add a steady stream of olive oil until the mixture has the consistency of a thick paste. You will need to add about 2–3 tablespoons. Divide the dough into four equal parts. Using a pasta machine roll the dough out until it you can see your hand through it. Place one of the pasta strips on a work surface that has been sprinkled with semolina flour. Spoon the filling onto one side of the pasta leaving a couple of centimetres (one inch) between the fillings and the edge of the pasta. Fold the pasta over and then press down around the filling to expel any air and to seal the pasta together. Using a pasta cutter cut between the filling mounds to make the ravioli. You should be able to make between 30 and 36 ravioli. 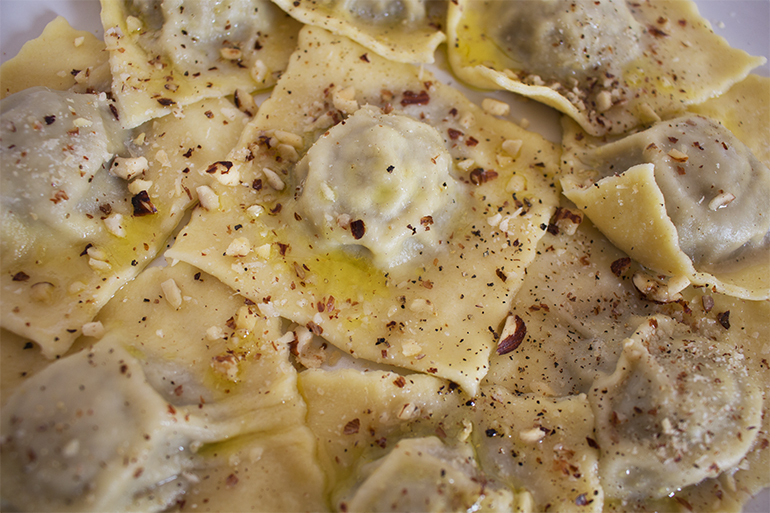 Place the ravioli on tea towels to dry for about an hour. Bring three liters (6 pints) of water to the boil. Add 3 teaspoons of salt. Drop the ravioli into the water and cook for about six minutes until the edges are al dente. Drain and served drizzled with a little olive oil, lemon juice and sprinkled with the reserved chopped hazelnuts and some ground black pepper.